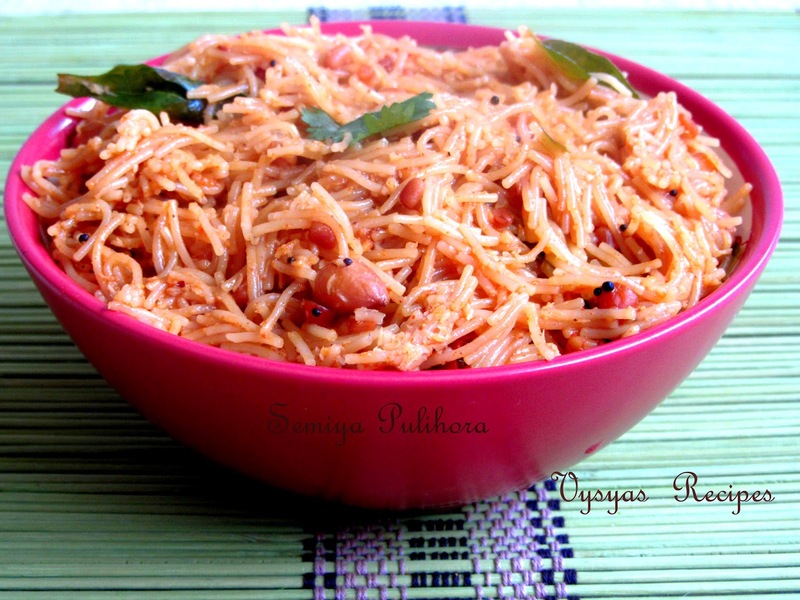 Semiya Puliyodarai is a Tangy Semiya upma made with tamarind and some spice powders. This is a Simple quick tiffin recipe, that we can make at busy morning. it is a variant of semiya upma.it is a Easy bachelor recipe. Water - 1+1/2 cups [including tamarind extract]. tamarind - goose bery size. Red chillies - 2. [broken into 2]. idli milagai podi - 1/2 tsp. Coconut Grated - 2 tbsp. chana dal - 2 tsp. Soak the tamarind in one and half cups of water to prepare tamarind extract, retain the water and through the pulp. dry roast the vermicilli,if it is not roasted. Heat the oil, add mustard seeds when it splutters add chana dal,urad dal,curry leaves,Red chillies.When dals turns golden brown colour add Roasted peanuts and saute for one more minute. Now add tamarind extract(which is already soaked in 1 +1/2 cups of water, so no need to add water seperately). Add jaggery,salt,chilli powder,turmeric to it. When it starts boiling add roasted semiya, stir it, until it is cooked well, and all the water is absorbed. Add idli milagai podi give a quick mix. Then add coconut mix for 2 more minutes. Now delicious semiya Pulihora is ready to serve. Adding idli milagai podi adds additional flavour to semiya, if you don't have you could add 1 tsp of chilli powder instead.